Come Say Hello at All Hell Breaks Loose! Attention Australian “Supernatural” fans! We’re packing up our suitcases and travel pillows and will be at attendance at the upcoming Hub Productions All Hell Breaks Loose “Supernatural” convention in Melbourne on Saturday May 6 and Sunday May 7. Haven’t met our cheerful staff of volunteers just yet? We’re hoping you’ll stop by our vendors room table and say hello! 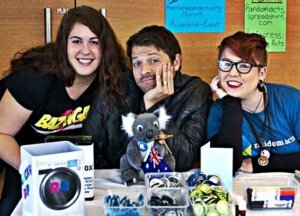 This time around, as we so often do, we’re pairing up with the local community to collect donations for a hardworking nonprofit, and for #AHBL8 weekend, we’re getting kind for one especially impressive organization: the Australian Red Cross’ Refugees and Asylum Seekers in Crisis Appeal program. 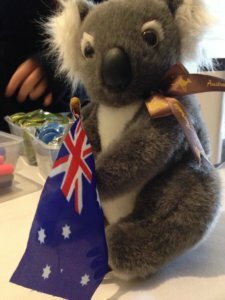 The Australian Red Cross has “millions of volunteers worldwide”, per its official website, and works to provide relief during natural disasters, “[re-connects] families or [finds] out the fate of loved ones torn apart by war or disaster”, and provides care and resources to vulnerable populations. The non-profit’s crisis program specifically provides “urgently needed housing, food and social support” to refugees and those seeking asylum, and builds “a more compassionate society through community education programs”, among other things. You can also donate directly through the Australian Red Cross refugee and asylum page here, if you’d prefer. What if I Can’t Attend the Convention? That’s OK! We know not everyone will be able to attend the convention (that’s quite the trip for anyone not located in Australia), so in lieu of your in-person attendance, we’re encouraging all supporters to #GetKind for an organization in their own community that supports refugees or asylum seekers. Make a monetary donation, donate goods, or even volunteer where you can, if the organization’s staff says its okay. Every little act of kindness counts. We’re ready to have some fun and do some good at the All Hell Breaks Loose convention — and we’re hoping you’ll come along for the ride. See you there!